Hi, I am interested in your 2015 BMW M3 (stock #45855NSC) listed on Autotrader for $39,997. I'd like to get more information about this vehicle and confirm its availability. 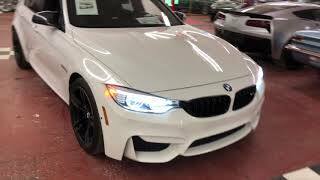 ESTIMATED MONTHLY PAYMENT $525.00, Here once again we have a 2 owner 2015 M3 in which is the performance variant of the 3 series sedan and is powered by a twin turbocharged 3.0 Liter I6 rated at 425hp and 406 Lb-ft of torque.The rear drive M3 uses a 7 Speed dual clutch automatic transmission; the paint on the vehicle is in very good condition along with the black leather interior.This M3 has all the options one can ever ask for, and now its ready for a new home. Take advantage of ourNO HAGGLE BUY IT NOW PRICE-Clean car fax-FACETIME AVAILABLE Give us a call or email us today.847-393-7887We also finance and offer delivery to your doorstep.